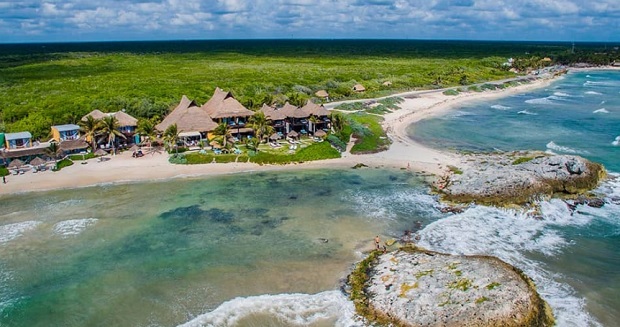 For travelers looking for a rustic and chill spot along the rocky Tulum coastline, the mid-range El Pez is ideal. All 19 rooms have cool tile or concrete floors, personal patio space, and come with free breakfast, free morning coffee delivery, 24-hour electricity and air-conditioning, organic toiletries, and great ocean views. Thanks to the hotel’s location — in a semi-restricted area — guests get a mix of coastline spots from a soft sand beach to elevated grassy banks to a rugged and rocky beachfront. Alas, the water here is choppy and not made for swimming. There’s also an excellent on-site restaurant with indoor and outdoor seating, a fantastic bar with tasty cocktails and healthy smoothies, and a small pool. Guarded by a picturesque scenery composed by seagulls, fishing boats and the Caribbean Sea. Whether on a family vacation, in which you can share an entire house filled with excellent amenities, or if you are traveling on your own looking for an indulging vacation, this “Seaside Chic” boutique hotel has everything you need to feel pampered and serene. 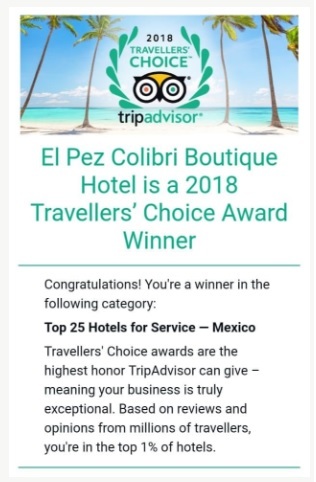 Comforting, insightful and relaxing, El Pez plays an exceptional role in inspiring creative minds who are passionate about experiencing an exclusive destination and expressing it through an artistic outlet such as writing, painting or photography. Let the sound of breaking waves rock you to sleep or take a walk along the cove to see turtles lay their eggs, one of nature’s most awe-inspiring events. The idyllic location of this hotel is an expression of artistry in itself.